Observation of moon goose behaviour under the influence of a total eclipse in Siberia, 2008. Like other migratory birds towards the autumn, moon geese migrate annually from the earth to the moon (reference: Francis Godwin, see next page). Will the moon goose get into flight formation or even head towards the moon outside their annually rythm? Will an eclipse affect any other distraction concerning their flight rythm and behaviour? Is the moon goose especially sensitive to the cosmic phaenomena of an eclipse? Does an eclipse evoke any extraordinary reaction? Any other heavy reaction to expect? 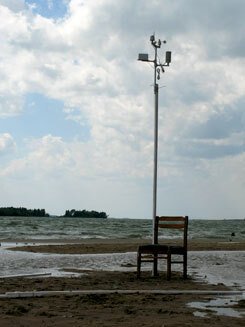 A chair is standing on a field / empty landscape with free view especially to the west and east axis. 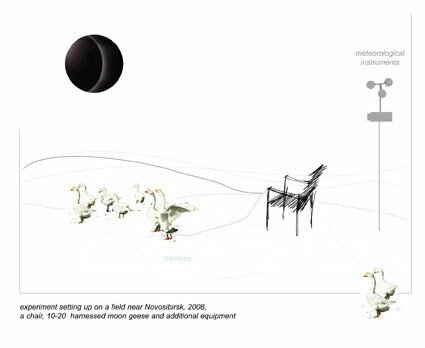 10-20 moon geese will be harnessed for a possible lift airborne. The experimentator in safety suit will sit seat belt fastened in the chair. In case of a possible take off the chair is fully equipped with necessary survival package and instruments to collect relevant data and meteorological observations such as temperature, light intensity (luxmeter) and wind occurence (anemometer) at the same time. The set up will be recorded on tape with 3 cameras from different perspectives. Experiment results will be evaluated and worked up for public presentation. In cooperation with Rostislaw and Olga Shilo, the directors of the Novosibirsk Zoo and Ulla Taipale, director of `s "Curated Expedition Project".